The sleek and luxurious InterContinental Hotel Boston, one of the city's most spectacular waterfront hotels, offers sweeping water views of Boston Harbor from higher floors. 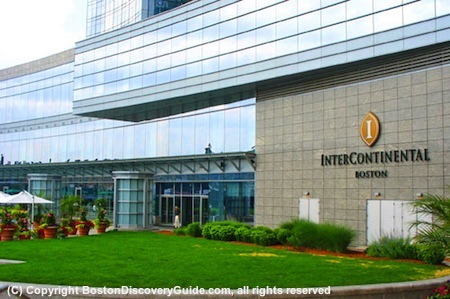 Located at the edge of Boston's Financial District, the InterContinental is a favorite with business travelers. 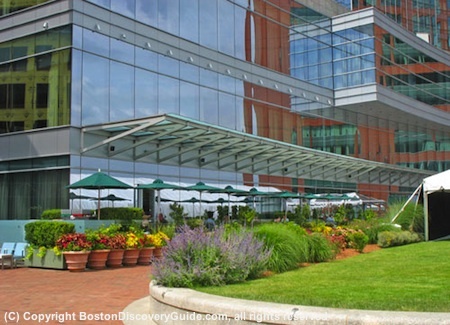 If you're a leisure traveler, you'll love the location between the Rose Kennedy Greenway and Ft Point Channel. Look out your windows, and you'll see gorgeous sunrises across the water, sailboats heading out to explore the Boston Harbor Islands, and ferries bringing passengers to and from nearby wharfs. The InterContinental Boston truly gives you the best of both worlds - a resort-like experience close to top attractions, terrific restaurants, Boston's Theater District, and our award-winning TD Garden sports/entertainment arena. Walk out the hotel's front door, and you're just steps away from the bustling downtown Financial District. The back of the Intercontinental Hotel Boston features serene patio dining flanked by lush flowers and spectacular views of Boston Harbor. 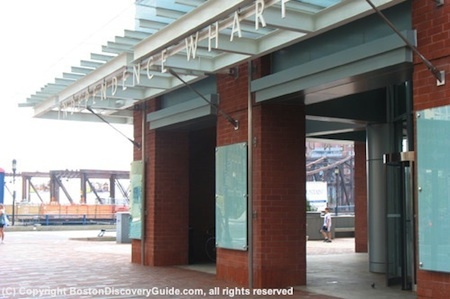 You can walk along Harborwalk, located right behind the hotel, and go all the way up to the North End, or across Fort Point Channel to the Boston Children's Museum and Institute of Contemporary Art in the South Boston Waterfront. Or just sit in one of the water-facing benches and relax as you enjoy the sea breezes. 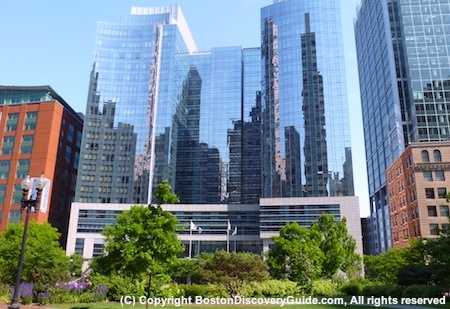 Convenience - you're steps away from Boston's Financial District, lively Waterfront and trendy Leather District restaurants and night spots, and family-oriented attractions such as the New England Aquarium and historic Freedom Trail sites. But why do most visitors choose the InterContinental Boston? In one word . . . luxury. 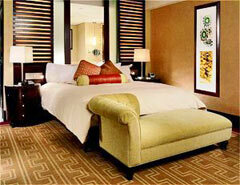 The 424 guestrooms and suites feature original artwork, luxe linens, and understated contemporary décor. Hotel guests occupy the first 12 floors of the massive building. And for those who fall in love with InterContinental Hotel Boston's location and services, floors 14 through 21 contain 130 “ultra-luxury” condos - so you can really be "at home" here. During warm weather, the Intercontinental Hotel Boston begins to feel like a resort. 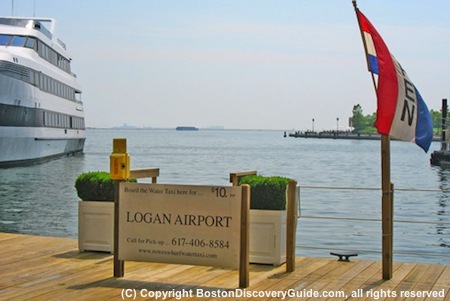 The Water Taxi at adjacent Rowes Wharf provides convenient 10-minute transit time to and from Logan Airport as well as a wonderful though brief cruise across Boston Harbor. The InterContinental Boston is within easy walking distance of most Downtown businesses and Boston tourism attractions, as well as the Boston Convention and Exposition Center in the Seaport District. As an added historical bonus for staying at the InterContinental Boston, you can say you’ve slept on top of Boston’s most famous historic site. The hotel on the actual site of the Boston Tea Party, where 342 chests of tea were dumped overboard in 1773 to protest British rule and taxation of the 13 colonies - a gesture that ignited the American Revolution. Walk to the end closest to the water of the adjacent parking garage on what is now called Independence Wharf. 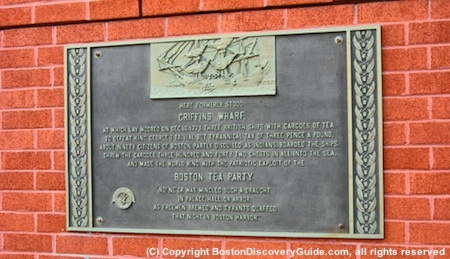 You’ll see a sign marking the location of the Boston Tea Party on the former Griffins Wharf. Want an even better view? Go into the lobby of the Intercontinental Hotel Boston's parking garage (door is at the corner near the street), sign in at the front desk, and take the elevator up to the free 14th floor Observation Deck. Along with the Prudential Skywalk, this is one of the best spots to get an aerial view of the city. Despite the fabulous waterfront location, terrific amenities, and top service, rates at this InterContinental can be surprisingly reasonable - although of course they do rise during the summer. To be sure you're finding the best deal, check out . Sometimes by paying a little more, you can also find special packages with things like spa services or even a Boston Harbor cruise thrown in.